Cosy. The cast of ‘Apartment 40c’. Photograph: Courtesy of the production. Despite narrative faults, Apartment 40c is a surprising and engaging new musical, marking Tom Lees and Ray Rackham as a musicals writing duo to watch out for. One apartment, three couples, six lives. Apartment 40c in New York has seen many occupants of the years. Some of them have loved, some of them have lost, and some of them have found each other. By blurring time and place, it would appear that despite the age and era of its occupants, they have more in common with each other than you’d think. Nova Skipp (left) and Peter Gerald (right) as Kathryn and Edward. Photograph: Courtesy of the production. Librettist Ray Rackam’s almost sci-fi multiverse approach to three different couples is an interesting experience as the stories cross and interact indirectly in very interesting ways, creating a curious enigma about how, and even “if”, these sets of people are linked together. By doing this, Rackham frames the way for some astute exploration of the human condition in surprising ways. Even if you don’t quite connect with the characters on a personal level, or aren’t entirely convinced by their situations, there’s a very clear and intelligent empathy that chimes whenever they open up. It’s never over the top when this happens either. Everything is very honest and as is, meaning you as an audience member take away what you want from each emotional encounter, rather than being told what to feel. This casual and arms length approach continues even when looking at some of the more severe circumstances the characters are placed in, such as loosing a loved one. The result is a musical that is very personal to each audience member. However, not everything in the actual narrative is as slick as it could be. Some of the couples and their situations aren’t really convincing. For example Eddie and Katie’s double-booked apartment is a bit far-fetched, but not as bewildering as the situation they end up in at the end of a single evening. Elsewhere, plot points and revelations feel contrived, adding to disbelief rather than the suspension of belief. But it’s Rackham’s ability to make an audience feel and think that’s the main event, despite the sometimes ropey narratives. Plot faults are therefore small niggles rather than major issues. So what if the story is a little unconvincing? The point is how we emote rather than whether we believe. 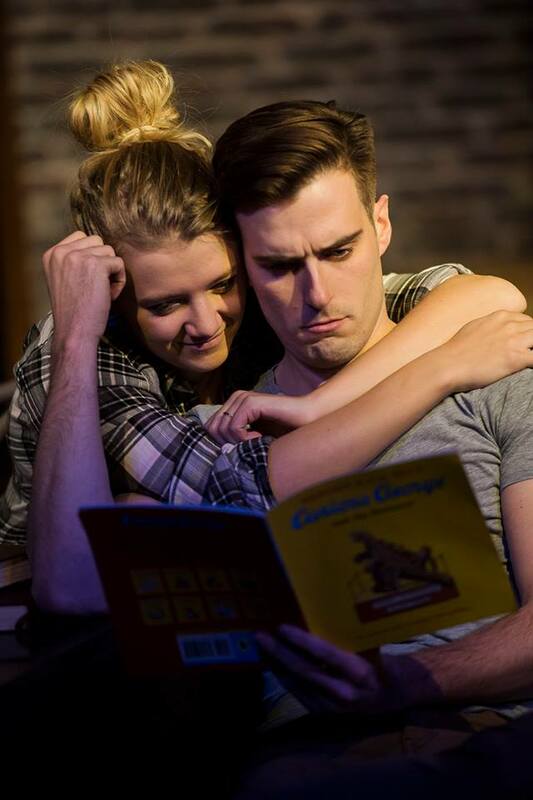 Alex James Ellison (left) and Alex Crossley (right) as Eddie and Katie. Photograph: Courtesy of the production. At first, Tom Lees music seems a bit too recognisable: something along the lines of the American rock music style than has been replicated (often poorly) ad naseum since Rent. However, though familiar, Lee’s music is far from derivative. In it are little shocks and indiscretions with regards to tone and rhythm, deviating away from the formula enough to prick your attention. Lees has found a way to really make the style his own, and by doing so keeps your attention. There are a couple of really haunting ballads that are incredibly beguiling. “Fairy Tales” was my personal highlight from the score: a mixture of childhood innocence and adult pathos with a sweeping melody, performer perfectly by Alex Crossley. Rackham meets Lees’ musical idiosyncrasies by including unexpected internal rhymes and phrases. They don’t always work well with some feeling more clumsy than others, but they’re certainly interesting. Elsewhere, Rackham employs a more lyrical approach to exploring the themes and feelings that he’s already prying into, using alternative and more abstract imagery to achieve deeper understanding. This is where Rackham as a librettist really shines through, with an unmatched wit and imagination. Lees arrangements for piano, violin, and cello also work really well. Despite the humility of the ensemble, Lees prises a rich and tender sound from the trio that undulates and colours each musical number. It’s a shame that we only hear Lees’ music and arrangements during the songs, and perhaps a bit of underscoring wouldn’t have gone amiss given just how enchanting it is. Music and lyrics is certainly the strongest aspect of Lees and Rackham’s partnership. In fact, even if you go wanting to hate this, it’s simply not possible. Yes, you can pick at the smaller foibles, but the score has an absolute and inescapable charm. Maybe, with a different narrative and/or a dedicated book writer, Lees and Rackham can be the new British musicals writers that we’ve been waiting for. Jonti Angel and Evie Holdcroft’s set is incredibly striking, turning the upstairs theatre space of the Eel Brook Pub into a real doppelgänger for a New York apartment. It’s brimming with detail and minutia that really lifts the show. Lees and Rackham,also directing, make good use of the generous space, often having all characters on set at all times, and sometimes choreograph their movements the intricately intersect each other, sometimes recognising but often ignoring their time-bound counterparts. It certainly adds even more enigma and questions to just how closely are these people interlinked. It’s a slickly executed show despite its fringe credentials. 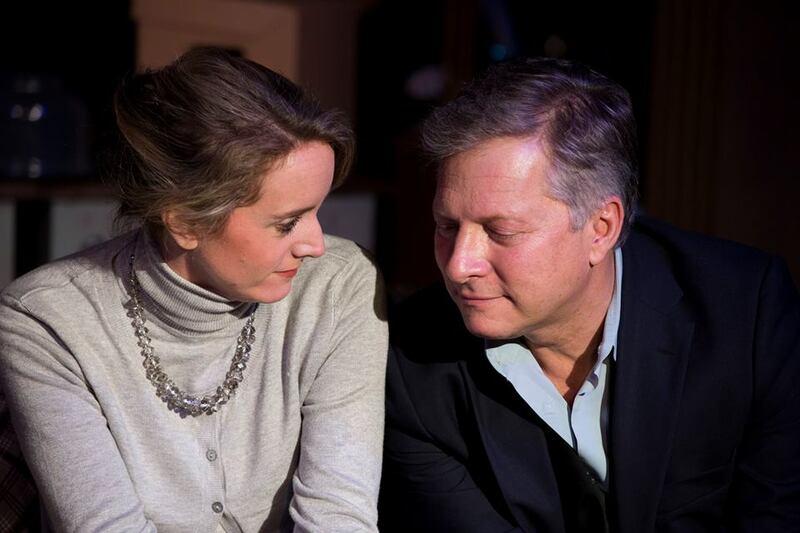 Lizzie Wofford (left) and Drew Weston (right) sharing a tender moment as Kate and Ed. Photograph: Courtesy of the production. Lees and Rackham have a solid cast on board, although some of the younger actors come across as a little inexperienced alongside more established talents. But overall, it’s very difficult to really pick out anyone particularly outstanding. If any warrant a particular mention, it’s Lizzie Wofford as long-suffering and good wife, Kate. She has a lot of fun with her character in the little humours she puts up around her as things don’t quite go her way. Her on-stage chemistry with partner Drew Weston as Ed, is really natural and wonderfully sweet too, helped by the fact that he seems to really enjoy playing his role too. However, when push comes to shove, there is a real strength that she finds in her character’s vulnerability, powering on despite the difficult situation she ends up in without completely breaking down. She’s a powerful actress to watch perform in perhaps the strongest of the musical’s roles. It’s not only impossible not find something to like, but something to love. Original and beguiling, this is a thoroughly enjoyable musical penned by a duo with astonishing promise. 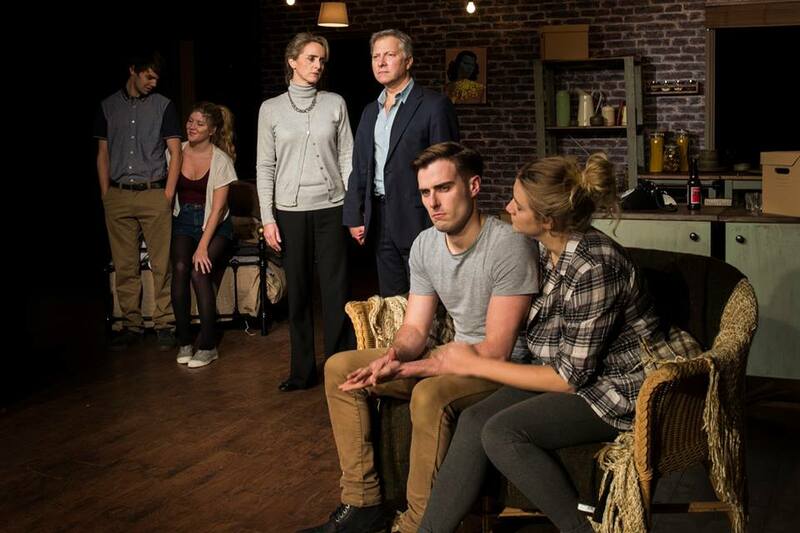 Apartment 40c plays at the London Theatre Workshop, London, SW6 4SG, until 20 December 2014. Tickets are £15 (concessions available). To book, visit http://londontheatreworkshop.co.uk. This entry was posted on Tuesday, December 9th, 2014 at 14:34	and tagged with Apartment 40c, Apartment 40c London Theatre Workshop, Apartment 40c review, Lizzie Wofford, London Theatre Workshop, new british musical, new musical, new writing, Ray Rackham, Tom Lees and posted in Thing What I Saw. You can follow any responses to this entry through the RSS 2.0 feed.